In the spring of 1824, the Norfolk harbor garrisons were transferred to Fort Monroe, the newly completed Third System fort at Old Point Comfort. The Quartermaster General’s Office hired a civilian, James Ruggles, to serve as caretaker of the vacant harbor forts and the ordnance and supplies that were still stored there. 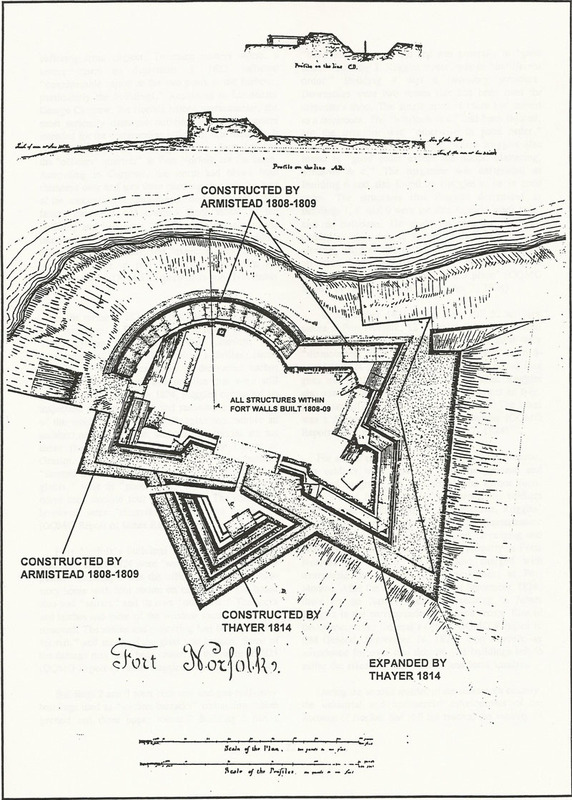 In September 1824, Ruggles conducted an inspection of Fort Norfolk and recorded a description of the works and buildings. Ruggles was neither an architect nor an engineer, and his descriptions are not those that might have been written by Thayer or Gratiot. To Ruggles's untrained eye, the ramparts, "fronted on the southeast side by advance works and glacis," were in "good order," whereas Gratiot had noted their decline four years earlier. The platforms, however, were "altogether decayed and destroyed" (OQMG Report of James Ruggles, September 7, 1824). Fort Norfolk's buildings were all constructed of brick and in late 1824 were "well coated with a yellow paint." Building 1 was the officers' quarters, a two-story house with four rooms on each floor. The house also had "sellars" and its own "outhouse." The locks and latches and some of the window shutters had been removed. The sashes and plastering had been "slightly injured,” and much of the glass was broken. Some of the damage may have been caused by the storm of 1821 (OQMG Report of James Ruggles, September 7, 1824). Buildings 2 and 3 were both one-and-one-half-story buildings used as "soldiers barracks” containing "three ground and three upper rooms." Building 2 had a "bake house” at one end and was generally in "good order." Building 3, Ruggles wrote, was in "indifferent order." Building 4 was a two-story structure. Downstairs were two rooms that had been used for carpenter's shop. The single upstairs room had served as a storeroom. The "windows & c." had been injured, but the structure was "otherwise in good order." Building 5 was the guardhouse, which Ruggles also found in "good order except the doors, plastering, windows & c." The magazine was designated as Building 6 and also found by Ruggles to be in good order. The structures that Ruggles designated as Buildings 7, 8, and 9 were the shot furnace, black hole, and an outhouse. He made no comment on their condition other than to document their existence. In closing, Ruggles was of the opinion that "very little attention and expense” would make a "great improvement in the appearance of this place" (OQMG Report of James Ruggles, September 7, 1824). In September 1824, there were still 52 artillery pieces at Fort Norfolk, 12 of which Ruggles declared to be "unserviceable." All but two of the guns were "dismounted" iron cannon ranging in size from 8- pounders to 24-pounders. There were 12 24-pound iron guns and 20 that fired 18-pound projectiles. Ruggles also counted two howitzers, one of which was an 8-in. piece made of brass and fixed to a carriage. The other was a dismounted iron 5.8 caliber howitzer (OQMG Report of James Ruggles, September 7, 1824). For a brief time after the opening of Fort Monroe, two soldiers were detached from the garrison and assigned to guard the two abandoned harbor forts. Shortly after James Ruggles was hired, the soldiers were sent back to their units at Fort Monroe. Ruggles' job seems to have included the role of a quartermaster charged with taking an inventory and "arranging and protecting" the movable government property at Forts Norfolk and Nelson. He was also charged with overseeing the transfer of the equipment to Fort Monroe. After the report and letter of September 1824, there are no further documents relating to James Ruggles in the correspondence or land record files of the Quartermaster General’s Office (OQMG Ruggles to QM General, September 16, 1824). Fort Norfolk lay abandoned for over two decades; its buildings left to suffer the effects of the weather and local vandals.